Here’s a recent favourite for the Globe “Quick Fix” column. The recipe is with the article HERE. 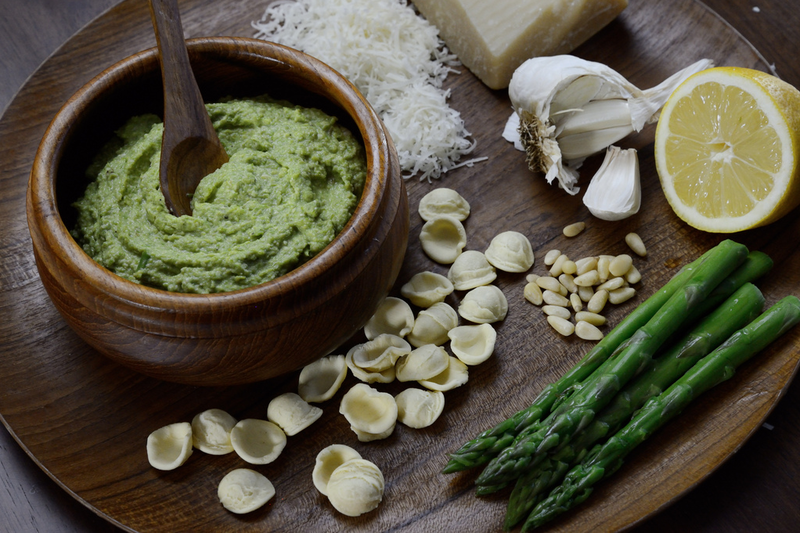 It’s so hard not eat a whole lot of pine nuts when making pesto–almost mindlessly–and then I keep reminding myself that they’re a kazillion dollars for a handful–probably worth more than Jack’s beanstalk seeds. But so yummy. And a little reminder if anyone is thinking about attending the Great Canadian Cheese Festival in Picton June 1-2, you can get a discount through the blog. Hope to see you there! 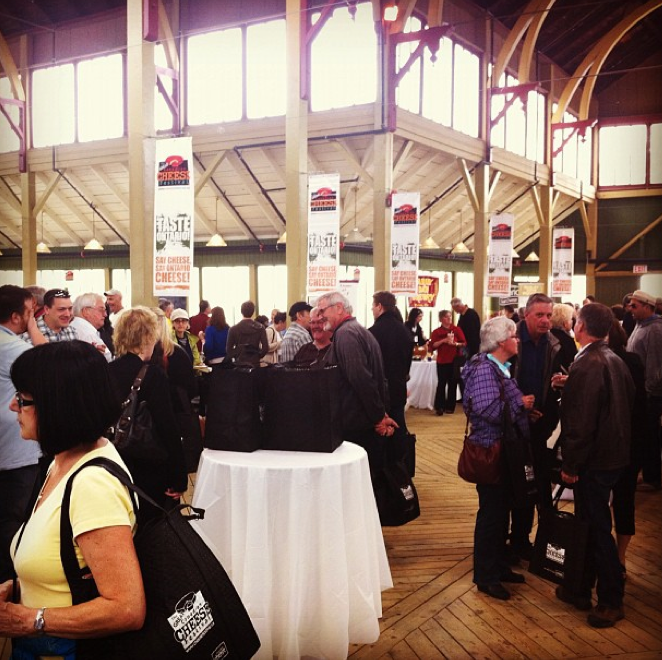 Great Canadian Cheese Festival only 40 days away! Get a 25% discount on tickets here. 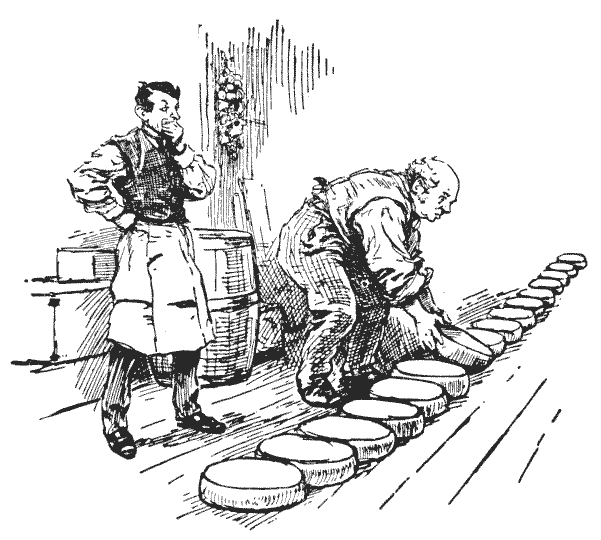 Hey everyone– just a reminder that the annual cheese festival taking place in Picton on June 1-2 is not so far away. Perhaps farther than Spring…..but perhaps not. Sigh. 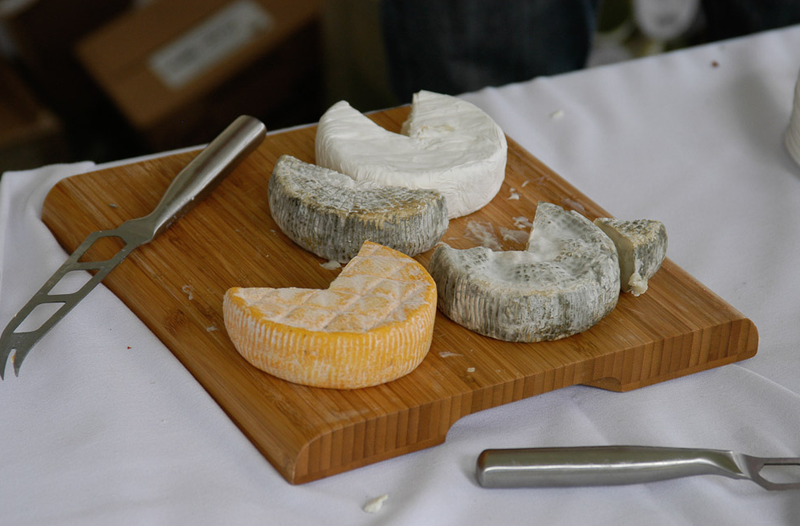 It’s an amazing weekend where you can sample cheese from across the country (Artisan Cheese and Fine Food Fair) while sipping local wine or cider and there are some fantastic seminars about everything from pairing beer and cheese, wine and cheese, different types of milk, Quebec cheese and so on. 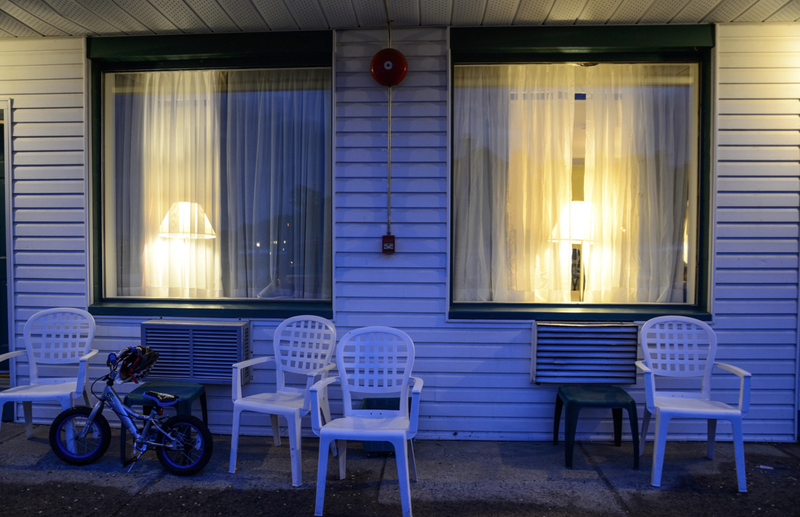 Plus all the dinner—Jamie Kennedy’s shin dig is sadly sold out–sorry. Anyway–if you’re thinking of going to website has accommodation suggestions too (some lovely Inns and B&Bs in the area) and of course wineries to be toured and tasted. As a special promotion for Cheese and Toast I can offer you a promo code to get yourself a discount on the event—just a little THANK YOU to all the people who follow the site. Get 25% off tickets for The Great Canadian Cheese Festival by entering the promotional code CF13TOAST before starting your online ticket order ONLINE here. Good only on tickets purchased online in advance of the Festival on June 1-2. 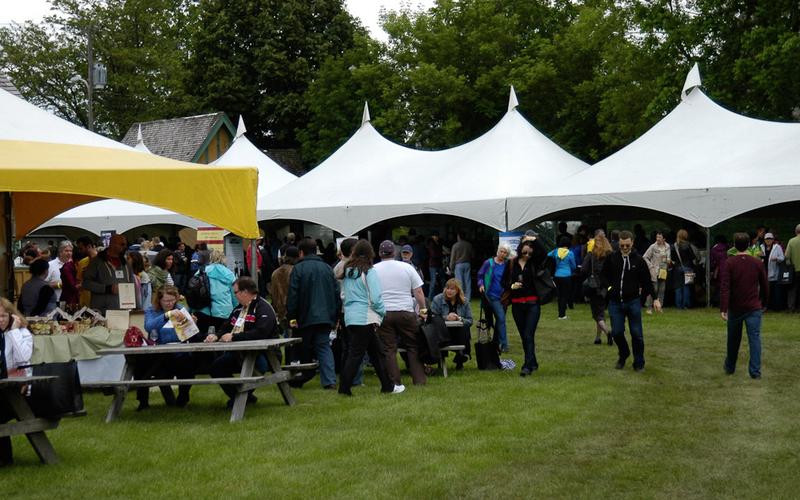 Visit cheesefestival.ca for information on the Festival. 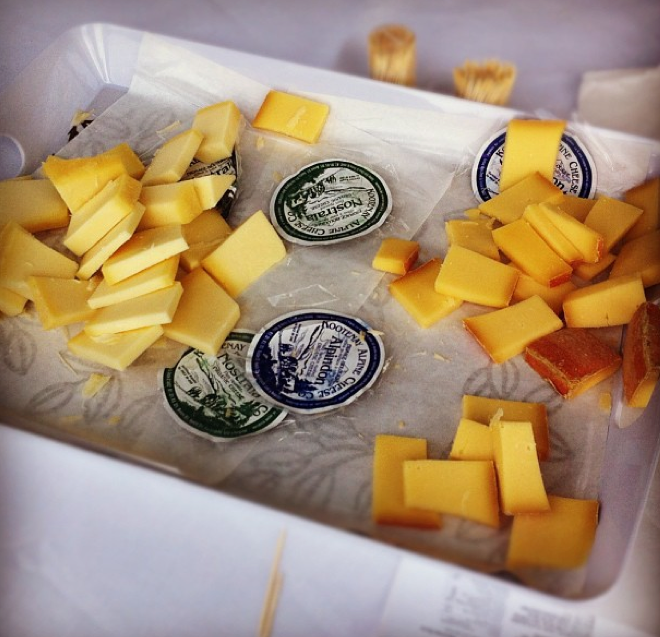 Hey, there was a really cool Cheese Festival in Picton. You’ll wish you were there. 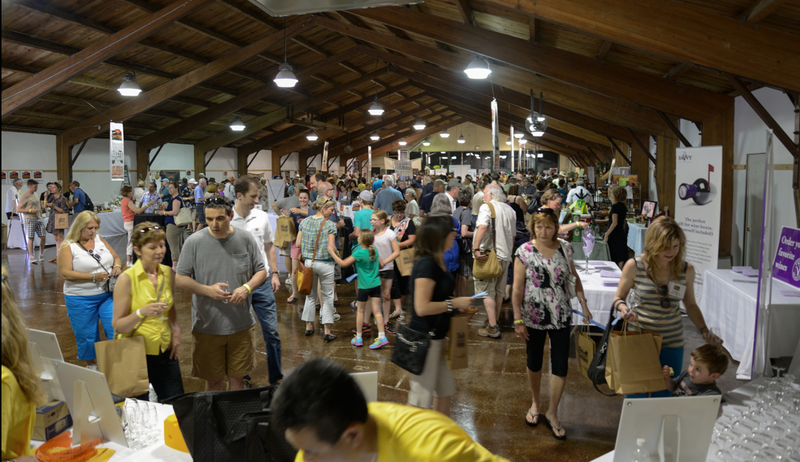 The 2nd Annual Great Canadian Cheese Festival happened the first weekend of June and it was a grand ol’ time. Even the dreaded rain did it justice and held off. Though I missed last years event I will book my weekend for this event from now on. 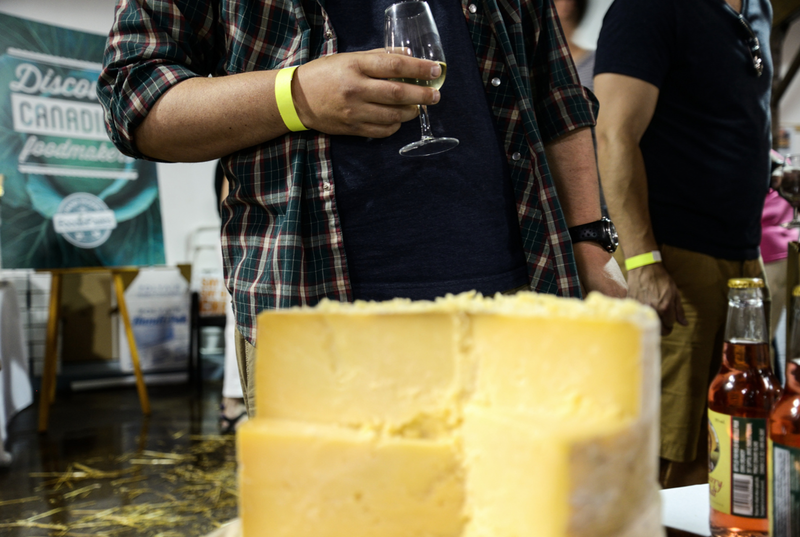 Overhearing the conversations around me, it was exciting to hear a real mix of industry people, cheese lovers, food lovers and just people looking for something tasty–all gathered in one spot. Above are the tents set up all around the Crystal Palace where the main part of the festival happened over two days. And here is the interior, it was pretty jam-packed. 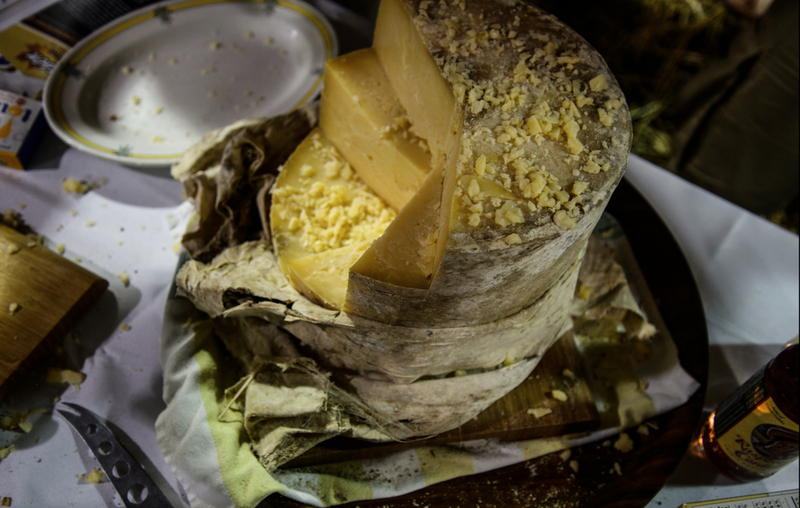 You would buy tickets inside and use those to sample many delicious things such as cheese (of course) but also local wine, brew, preserves, breads and other fine food. And as much as there were loads of people there was plenty of opportunity to chat with the producers and learn more about them. It was very friendly and casual. 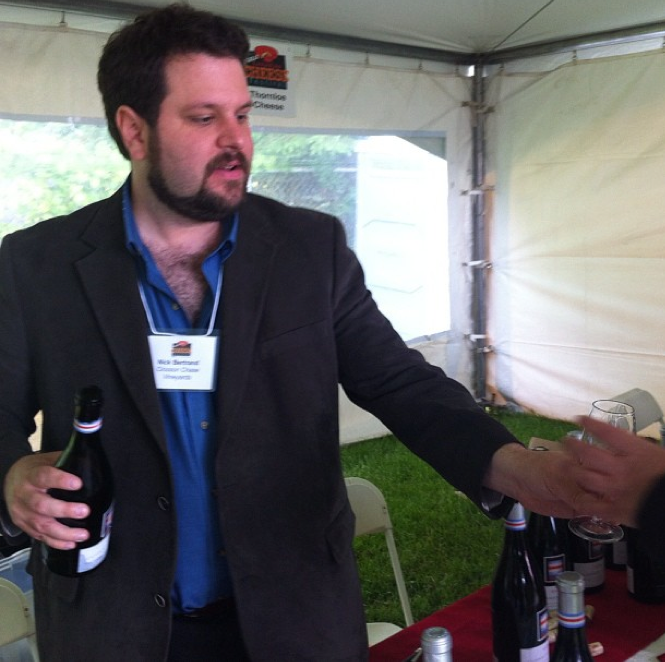 I used up many a ticket walking around with a sample of the 2009 Closson Chase Pinot Noir. 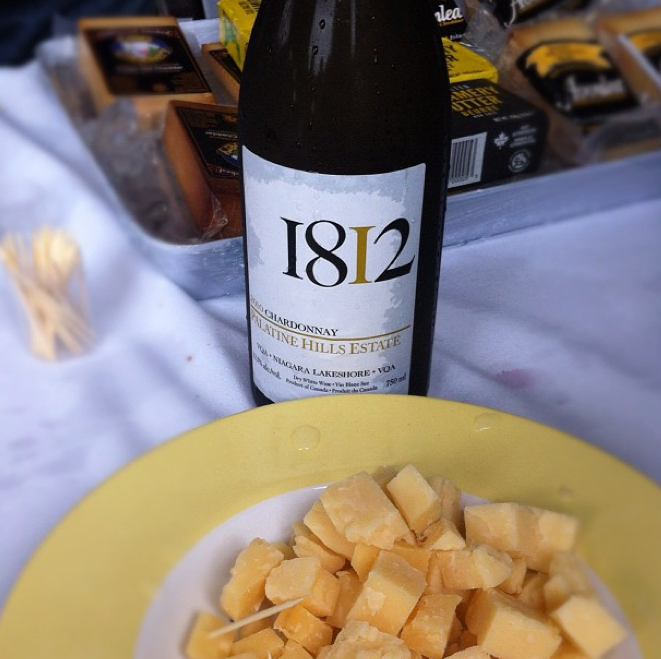 But a person does not want to ignore Chardonnay either so here I tried the 1812 from Palatine Hills Estate with Avonlea Clothbound Cheddar. The wine is technically from Niagara Wine Country but it is a tribute to the anniversary of the war. So, who can fault that? 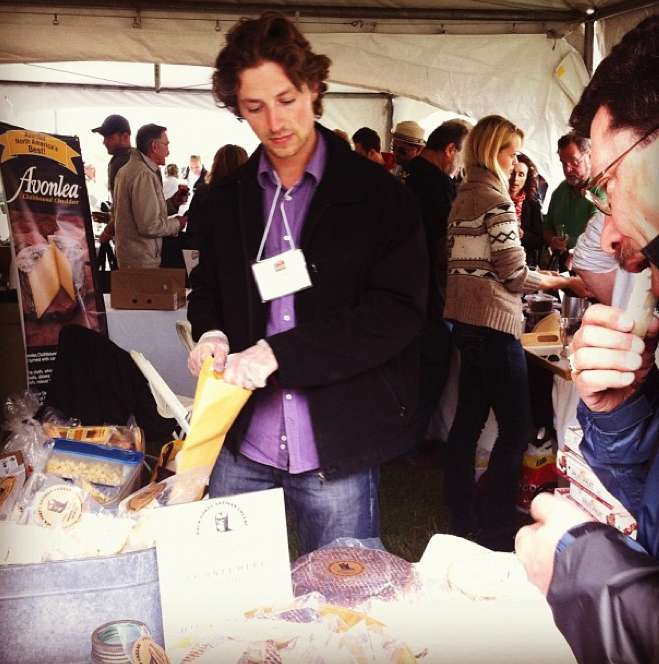 Then I moved over to the Back Forty booth where Jeff Fenwick was sampling their Highland Blue and the Bonnechere (with its toasted rind). From East coast to Ontario to West Coast, it is impossible not to recognize this beautiful trio from Salt Spring Island. Romelia is the pale gold lady, Blue Juliette is next to her and at the back is elegant Juliette herself. Some of my very favourite cheeses. Blue Juliette was the subject of the very first Spread Column (2008) ever, so I am particularly attached. 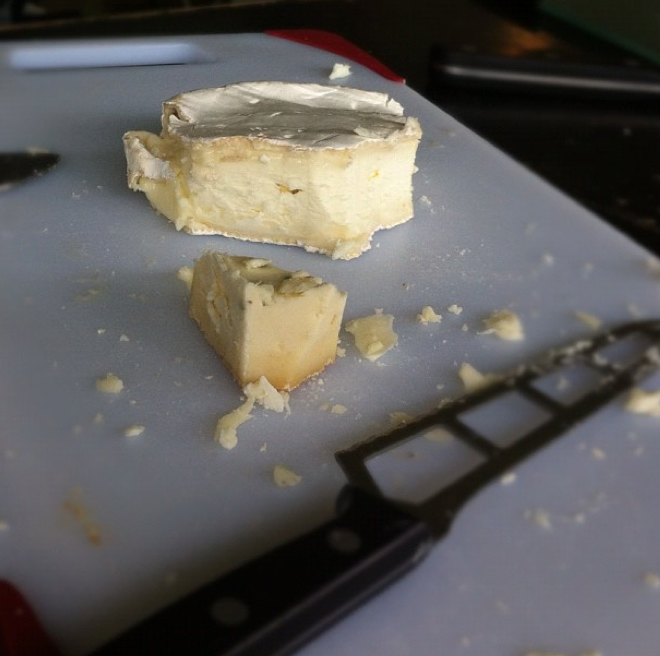 I then slid over to sample the amazing Alpindon and Nostrala from The Kootenay Alpine Cheese company from BC. 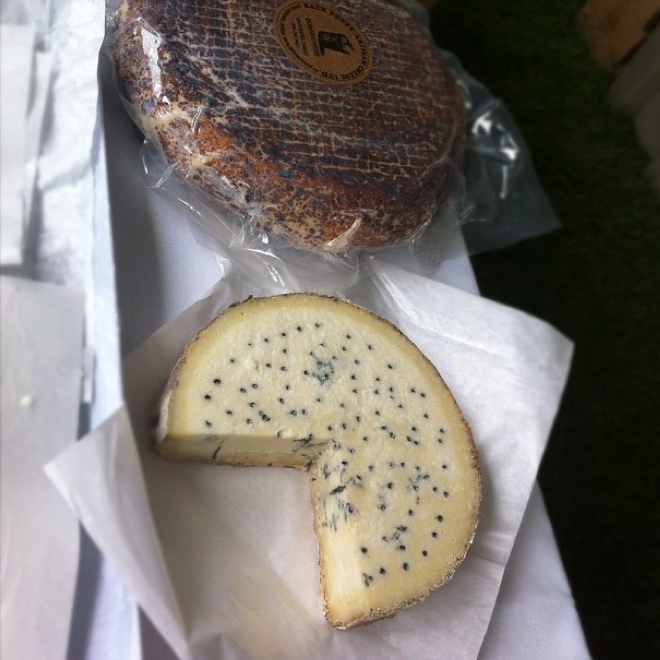 Both cheeses showcase the raw, organic milk they are made from. If you see them while shopping make you try these guys. They will become a staple. 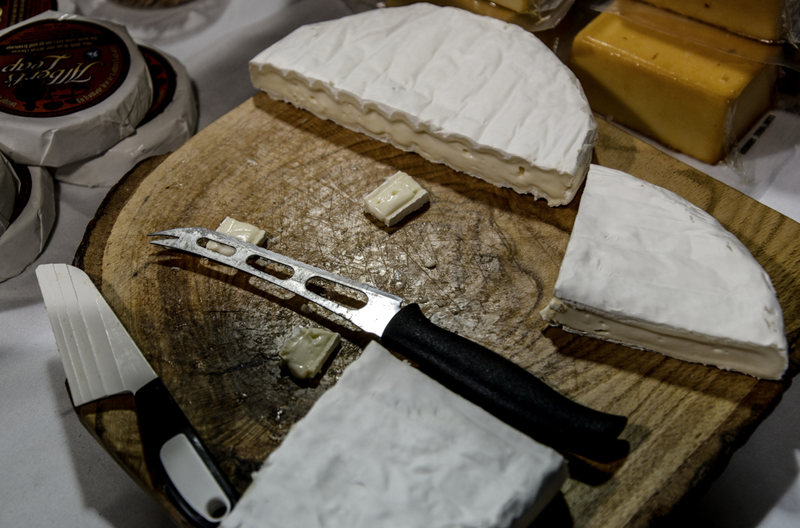 And I could not resist sampling this sheep’s milk, bloomy rind cheese called “Commanda” as a tribute to the Algonquin elder William Commanda– by John Thompson of Kendal Vale Cheese. 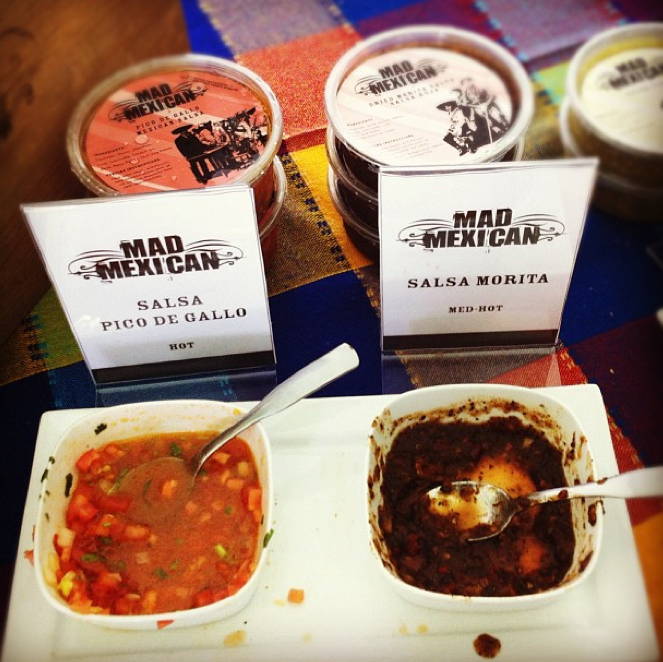 The dried and smoked morita pepper, a native of Mexico, give this salsa its distinct earthy flavor. Made from fresh charred tomatoes and sweet onions, it has a medium heavy body with a touch of heat. This morita salsa achieves complex flavors reminiscent of smoked and fire grilled foods. It boldly stands alone as a dip or adds the spark to grilled meats, shrimp and tomato base sauces. 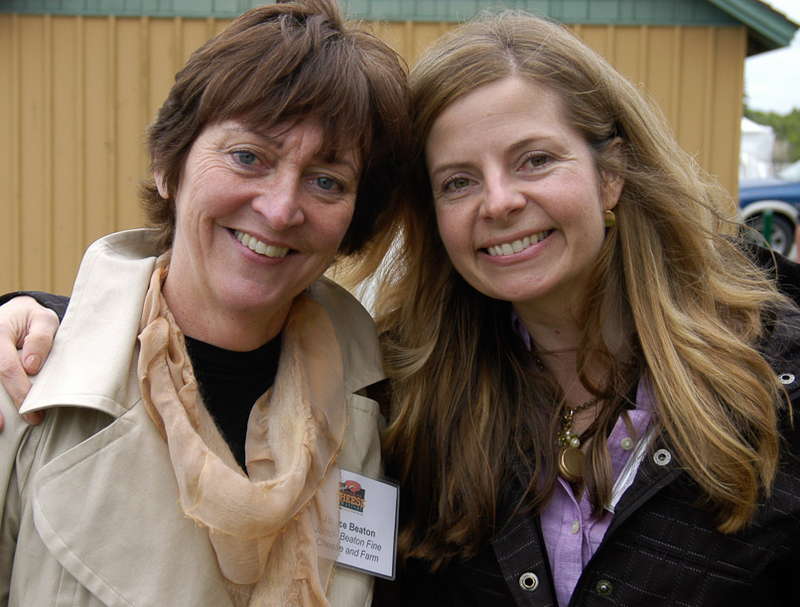 And this is me and Janice Beaton, the passionate cheese monger, owner of Janice Beaton Fine Cheese in Calgary and FARM a restaurant showcasing the wealth of Albertan foods. I had been dying to meet so was so happy to final talk face-to-face. And I will continue this post tomorrow as I realized I have not even taken you INSIDE the building and already am going long! This is Kelsie Parsons. 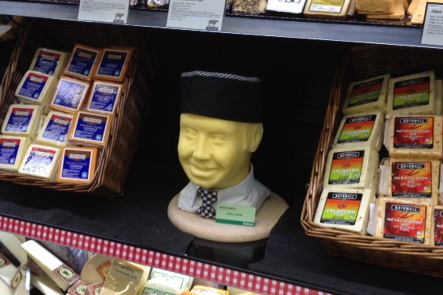 Well, it’s Kelsie if he were to be made of cheese (St. Albert Mild Cheddar in fact). Kelsie is the cheese manager at Sobeys Ira Needles in Kitchener. As you can see from his cheese doppelgänger, Kelsie is not only compact and shelf-stable but he’s amazingly passionate about cheese and knows a lot about it. 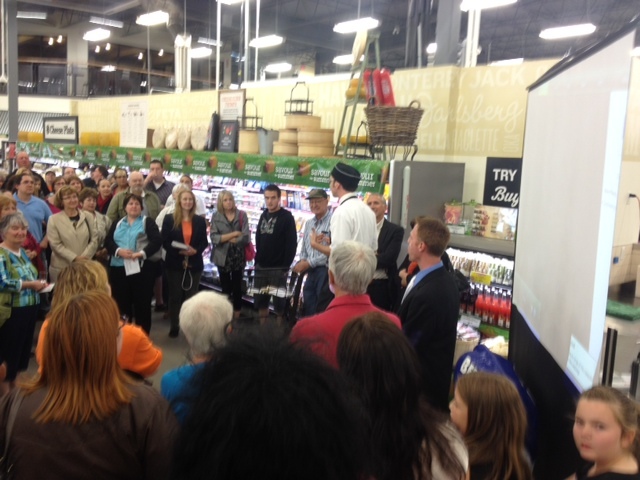 Kelsie speaks to his cheese peeps at Sobeys. I bumped into him at the Great Canadian Cheese Festival at the beginning of June and told me he’s taking the summer off to write a book about Canadian cheese. He’ll be touring Canada over three months and researching his book along the way. 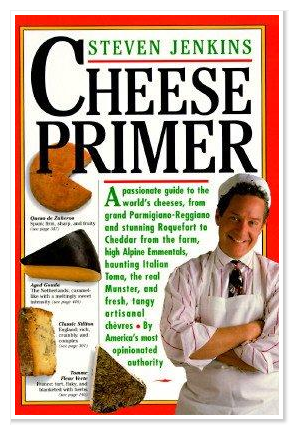 If any of you cheese lovers own a copy of the great cheese reference book by Steve Jenkins “Cheese Primer” this is Kelsie’s blueprint for his own writing. I was instantly smitten with his cause and also dying to hear about his adventures. I figured the people reading Cheese and Toast would probably love reading about this too. So Kelsie has agreed to write a series over the summer for my blog that we’re calling, “Curds and Eh”. 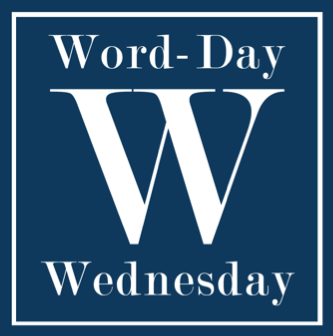 It will be published every two weeks on Wednesdays–starting tomorrow. I’m proud to be a part of chronicling this massive effort, and impressed with the personal time Kelsie is putting into this book. I hope all the cheese makers, cheese mongers and us cheese eaters across the country can support him along the way. 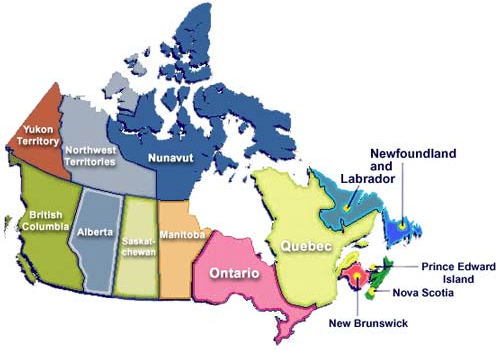 If you have some insider “cheese info” Kelsie should know about in your province leave a comment on this–or his future other posts–he in currently in Quebec and then heading to Newfoundland and the Maritimes. Enjoy this series, I know I will. 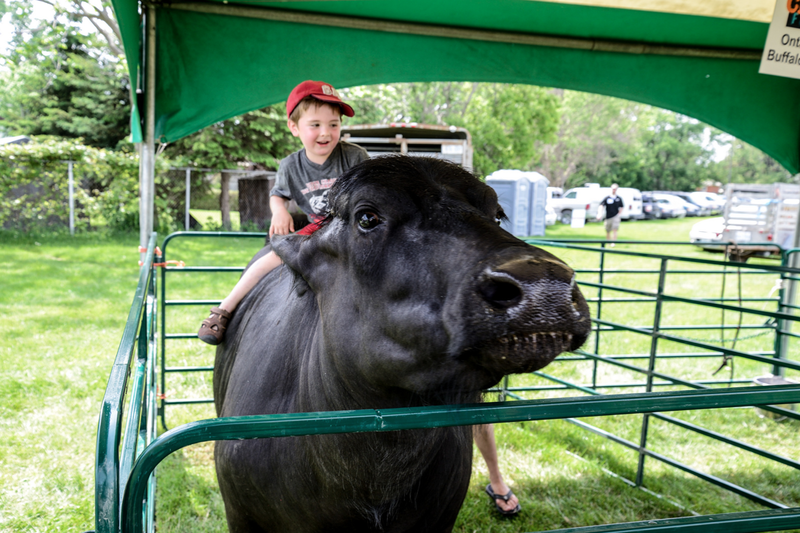 Happy Victoria Day– sorry to repeat myself–but in case you meant to enter the draw or were suddenly free to head to Prince Edward County June 1-3 I thought I’d send out a quick, “last chance” reminder. CLICK HERE–for more details, this will take you to the full contest post. Thanks to everyone who has entered so far and I will draw the winner at some point tomorrow. I’m getting excited about the festival myself! 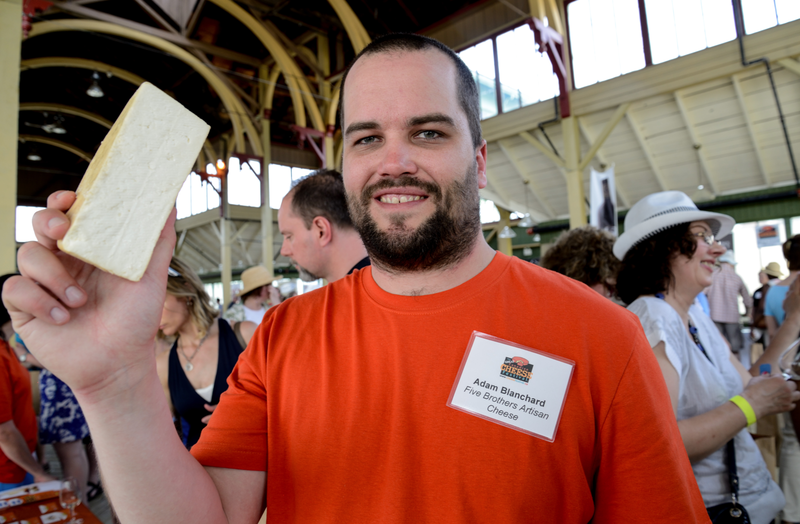 I’m very excited to be have two passes (courtesy of the The Great Canadian Cheese Festival) to give away for their Artisan Cheese and Fine Food Fair which takes place in Prince Edward County on June 2 and 3. This is the second annual event and numbers for the Food Fair will be capped each day so these are hot little tamales. 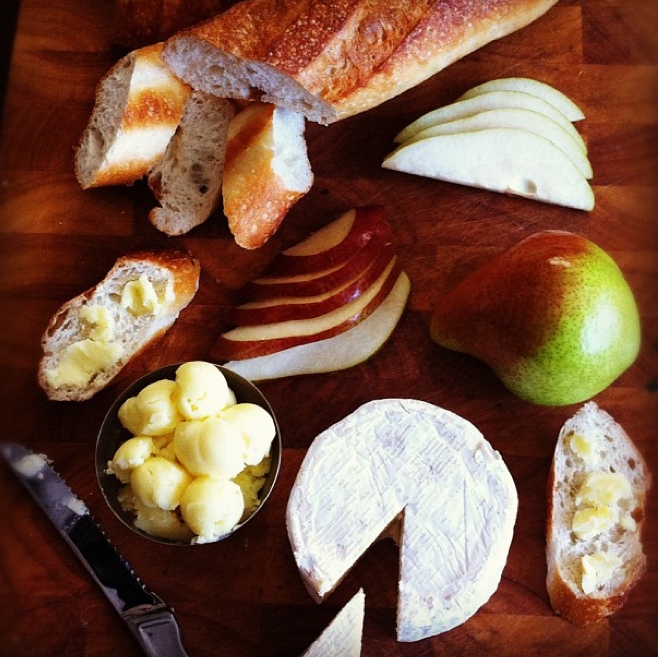 Monforte Dairy’s triple-cream Bliss and hand-churned butter will be available at the event. 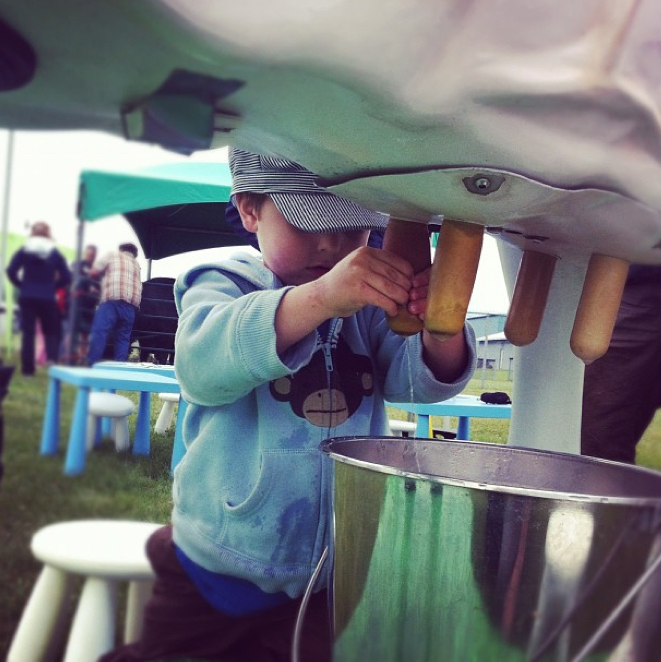 If like me, the above cheese board is your perfect meal, you won’t want to miss the Food Fair where you will find over thirty artisanal and farmstead cheese makers from across Canada plus a dairy farm for the kids (I plan to leave my son in the care of a responsible–but fun-loving–goat), a food court and 80 exhibitors in total showcasing their wares. 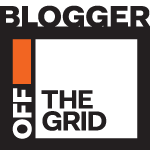 Here is a link to FEATURED WINERIES, CRAFT BREWERS and ARTISAN FOODS. 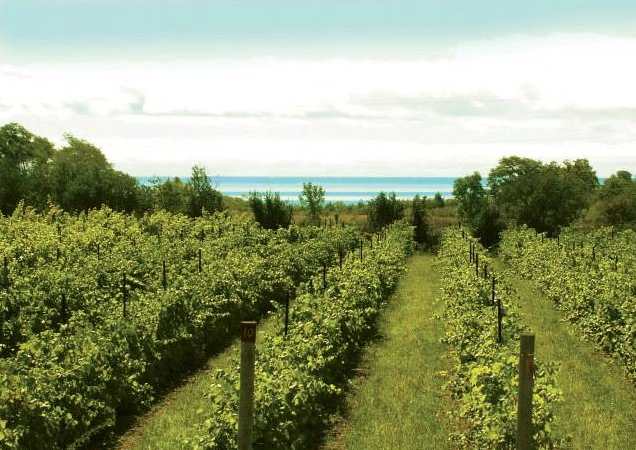 And if you’ve never been to Prince Edward County, you really must try to see it. It is a perfect weekend away. 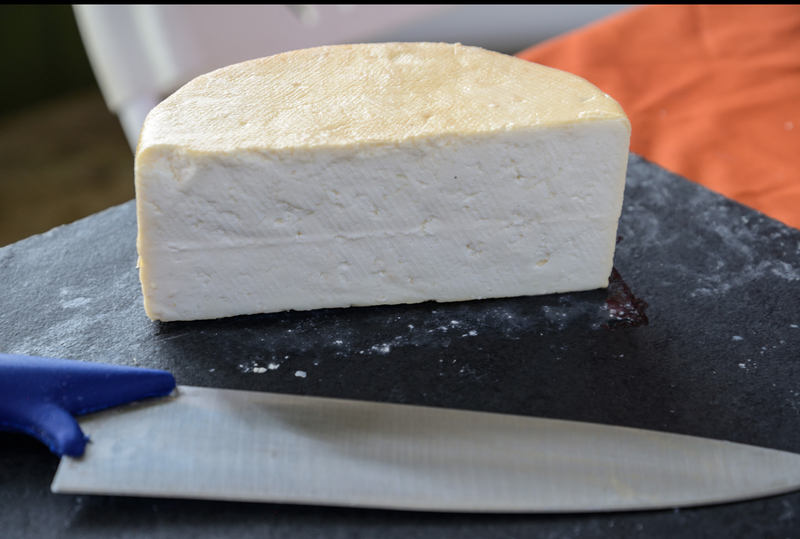 There is also a COOKS AND CURDS gala on the evening of June 2 which features Canadian chefs cooking with Canadian cheese, paired with local brews and wine. The first sitting is sold out but the second sitting is still open. Information about getting tickets to everything (but obviously you’re going to win these) is available on the festival site as is accommodation information. See you there! If you think you’d like to attend simply email me at thespread@globeandmail.com with the subject heading CHEESE FESTIVAL GIVEAWAY and I will do a draw next Tuesday, May 22 and mail you the tickets if you win. Good luck and please spread the word, forward this, tell your friends to pass on information about this amazing event. Much appreciated.